We’ll go through two days in today’s entry. Wednesday is a travel day, with no ride. We head south for one last stop at a Wisconsin cheese store. The car is full of cheese. And beer. And more cheese. We stock up on cheese and even more beer (a Minhaus sampler box) before driving to St. Louis. For lunch, we stop in Bloomington, Illinois, which is a happening town. They have windmill farms all over the outskirts, a Mitsubishi factory, and State Farm Insurance. They also have a bakery/cafe that we found on Yelp. 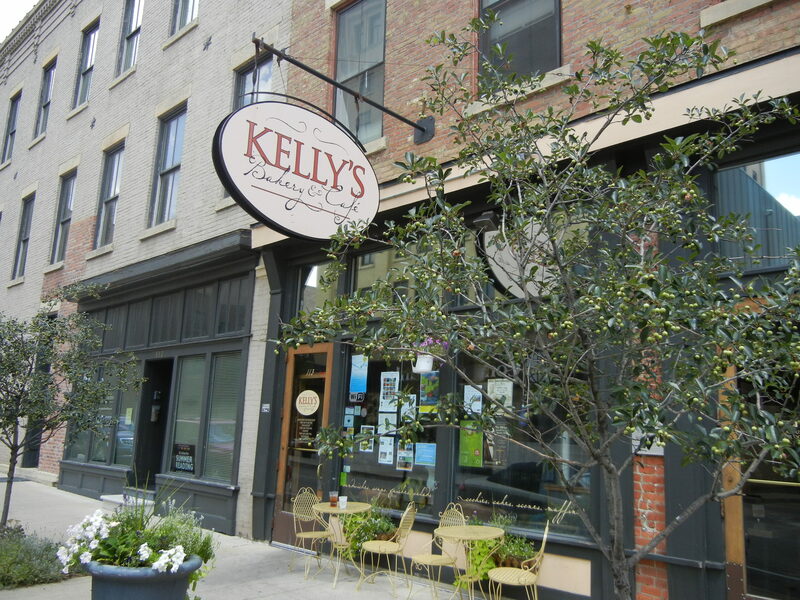 Next time you are in Bloomington, IL, check it out! Black Russian sandwich. 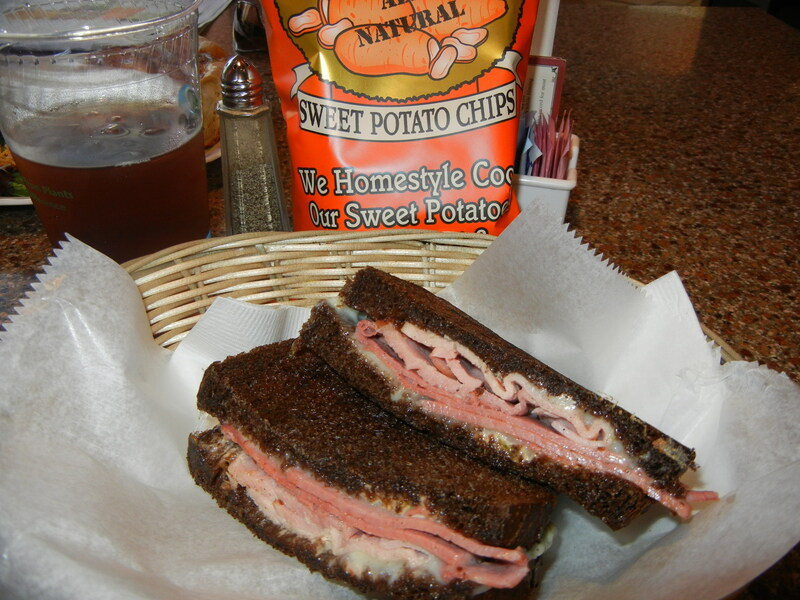 Turkey and roast beef on pumpernickel. 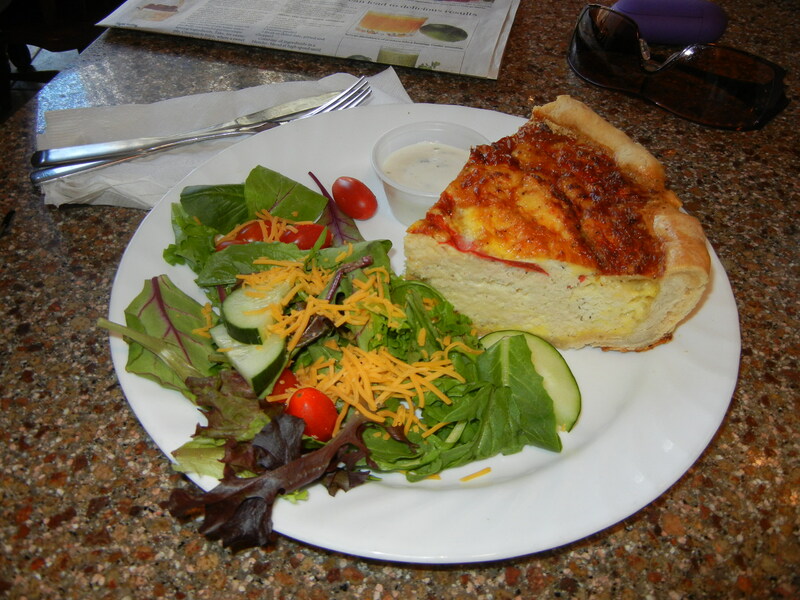 Good quiche. Real men don’t eat it, but I did. 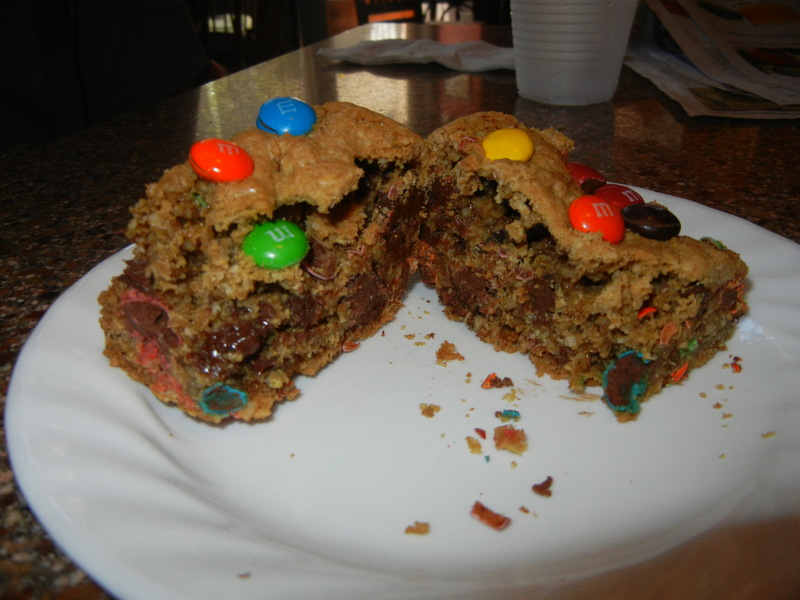 Could not resist the Monster Bar for dessert! I have never been to St. Louis before, so crossing the Mississippi while looking at the arch for the first time is an amazing sight. 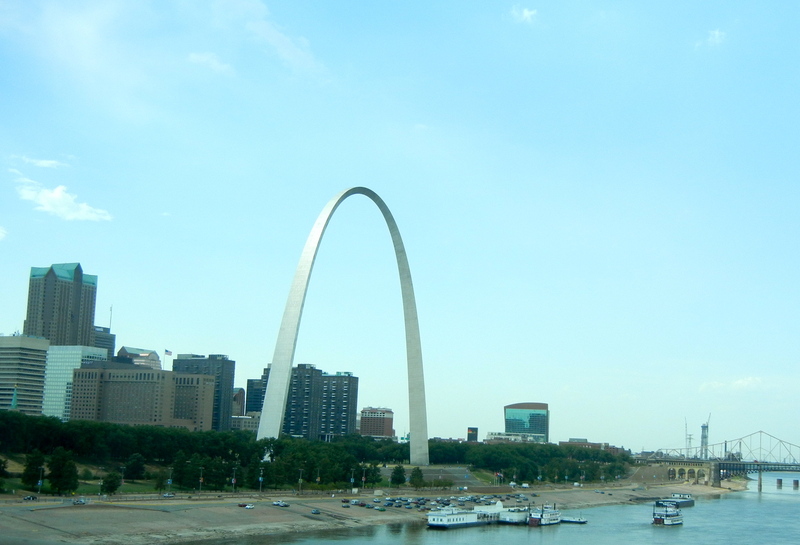 The Arch as seen from the interstate. 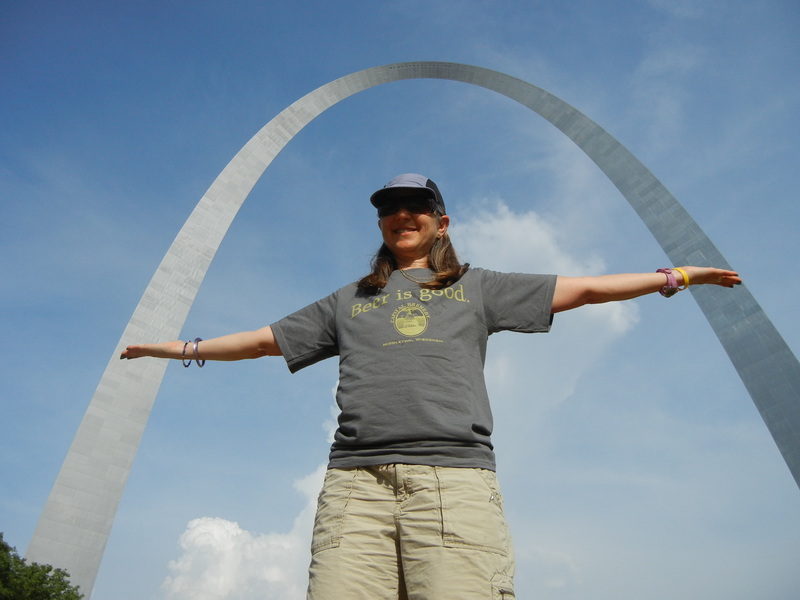 Even though it’s 100 degrees, our Hampton Inn is right across the street from the arch, so we walk over for photo ops, and there are plenty of them. Eve stretches at the Arch. For dinner, we meet the “Missouri Mafia” of the Georgia Tandem Rally for dinner at a brew pub across the street from our hotel. The Readys, Straws and Smiths come out to play. 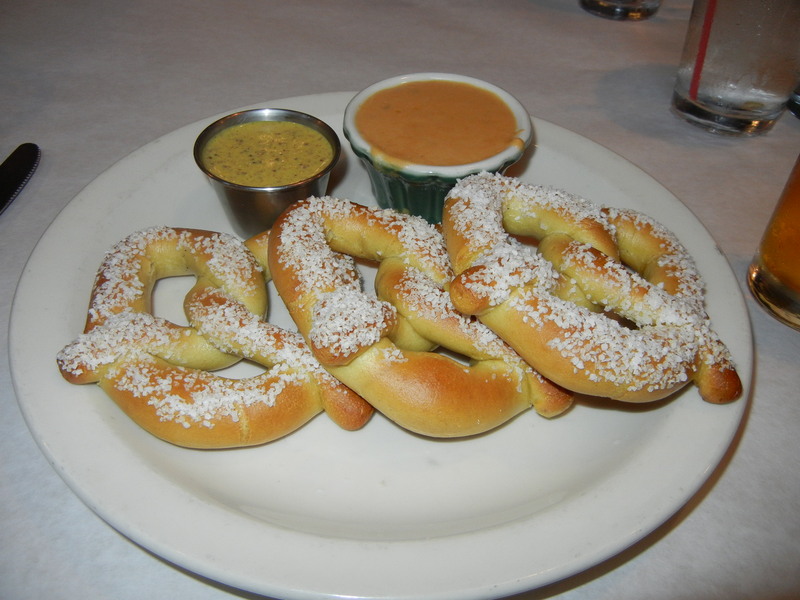 Pretzels at the Morgan St. Brewery. 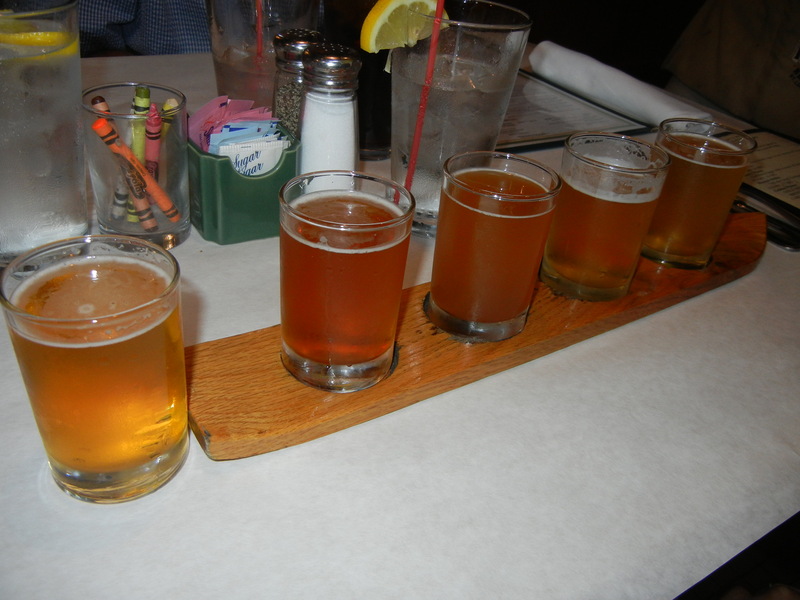 And the flight of beer we had. It was all the same color lager and they tasted about the same. More beer? Our seventh brewery of the trip. 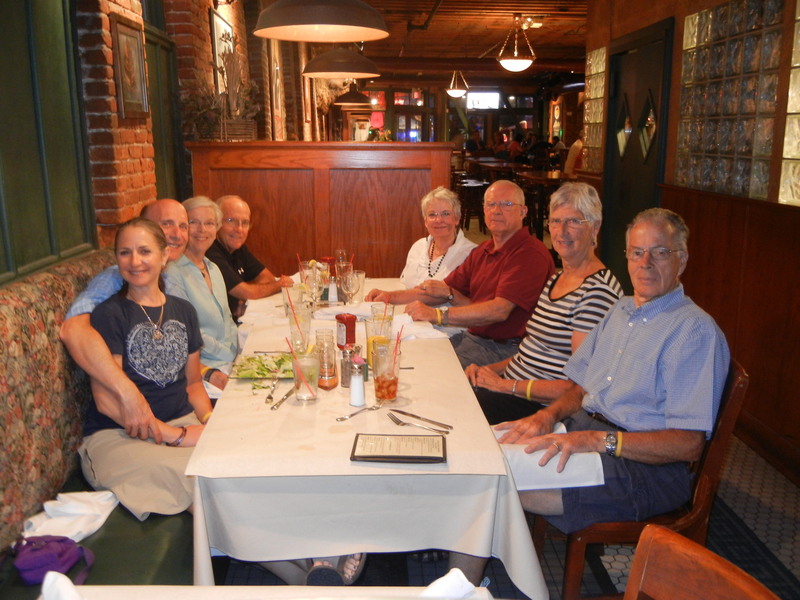 It was great visiting with them and we are glad that they could come downtown to meet us. Thursday is supposed to be another scorcher, so we wake up early and ride before breakfast. Today’s ride is very short and urban as we go see some of the sites in downtown St. Louis via the bike. Busch Stadium, home of the Cardinals. 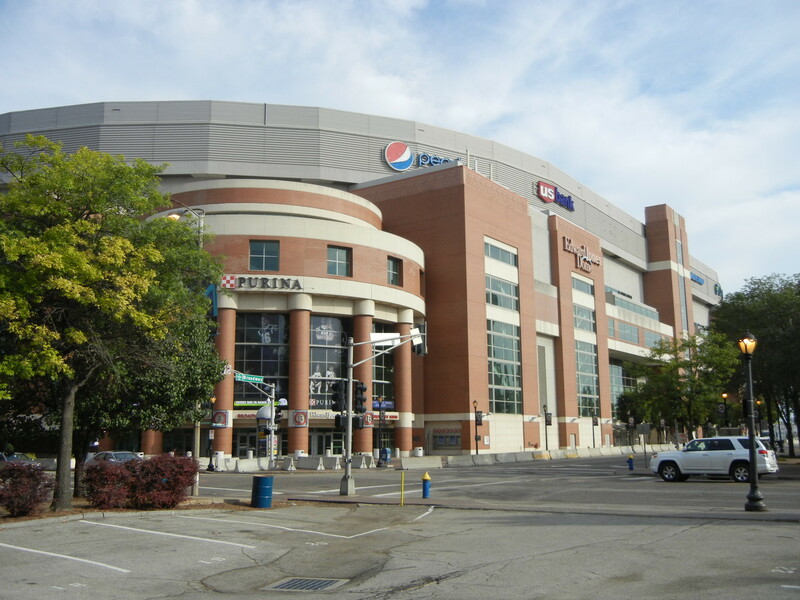 ScottTrade Center, home of the Blues. Edward Jones Dome, home of the Rams. 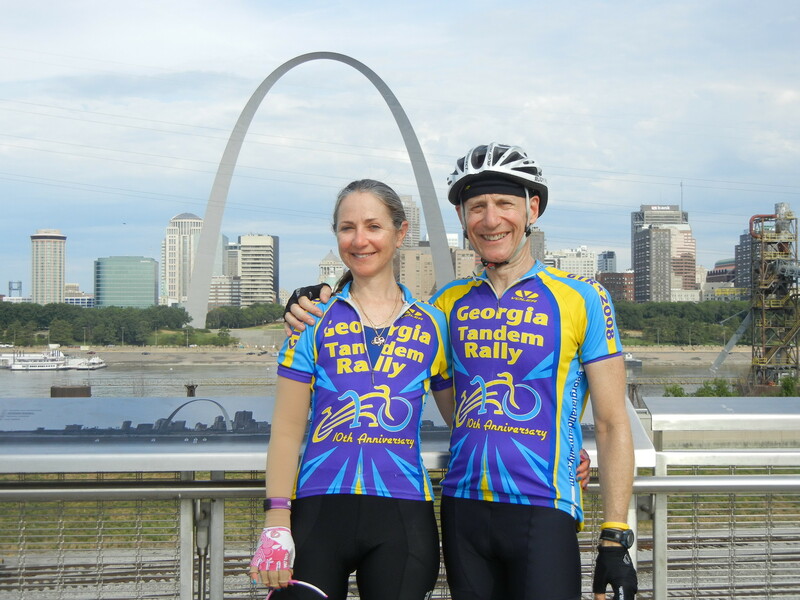 Then we ride over the Mississippi into Illinois. There’s just something about those state line crossings, especially when you get to do them over “Old Man River”. The Arch from the Illinois side of the river. 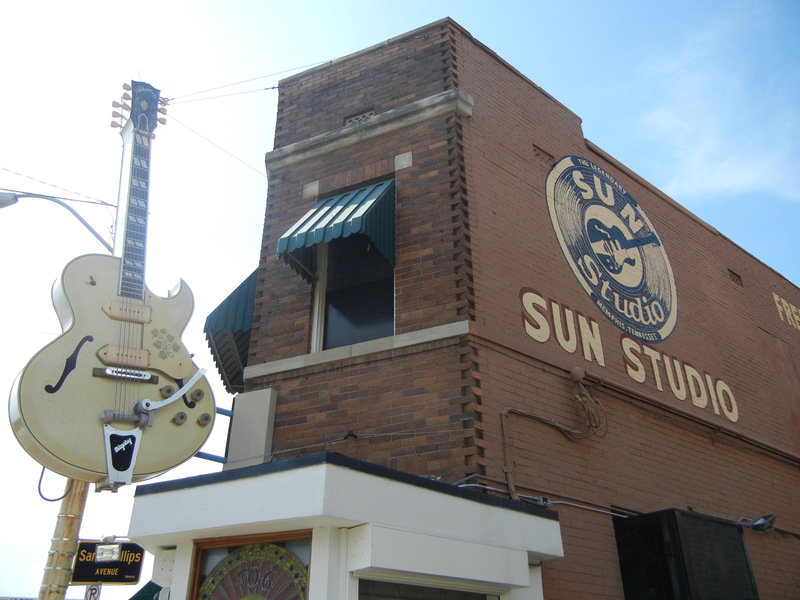 Our next destination is Memphis, and we roll in around 4PM, going straight to the Sun Studios tour. 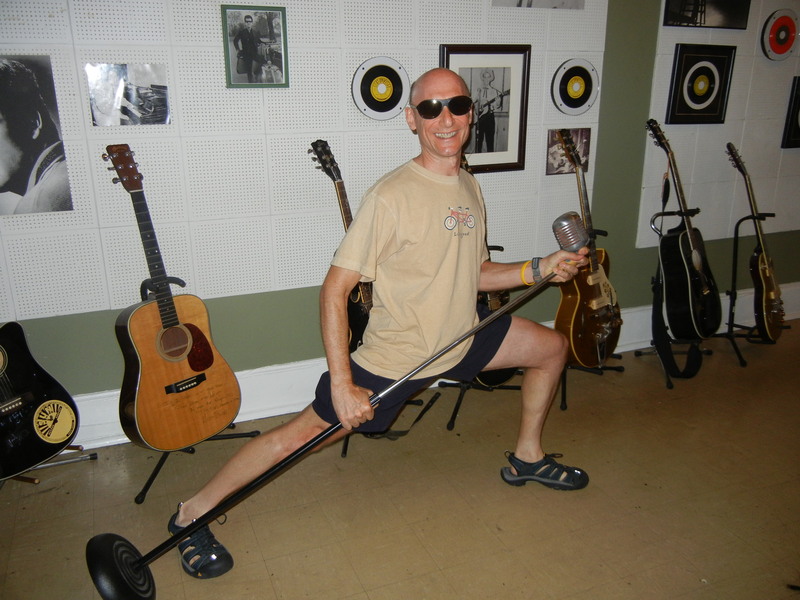 This is where Elvis, Carl Perkins, Jerry Lee Lewis, Johnny Cash and Roy Orbison cut their first records. 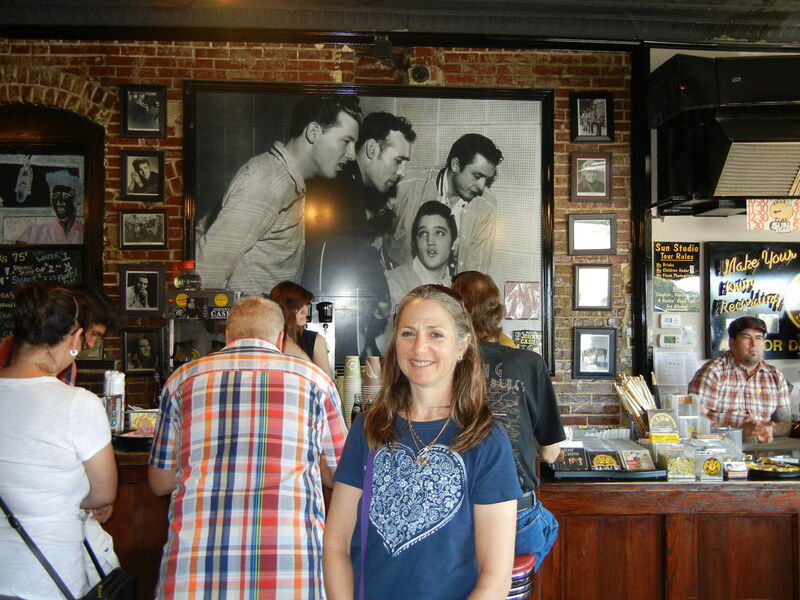 Eve poses with the “Million Dollar Quartet”. Bands still record here, but they didn’t ask me if I wanted to cut anything. We have been waiting for almost two weeks for Memphis BBQ, and tonight we get our wish. We meet our friends LoKo and Warner and they take us to Central BBQ a few miles from our hotel. This is exactly what we needed after two weeks of cheese. 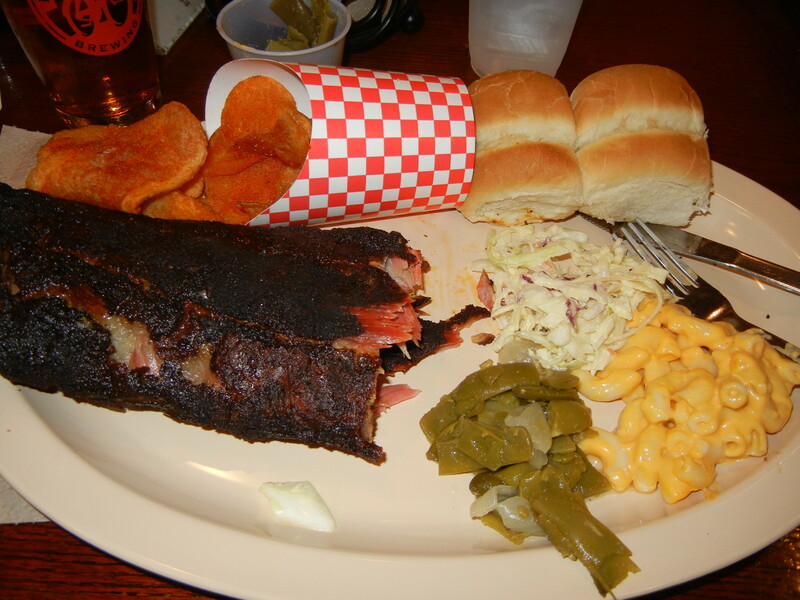 No cheese curds on the menu at all–just good old southern BBQ. 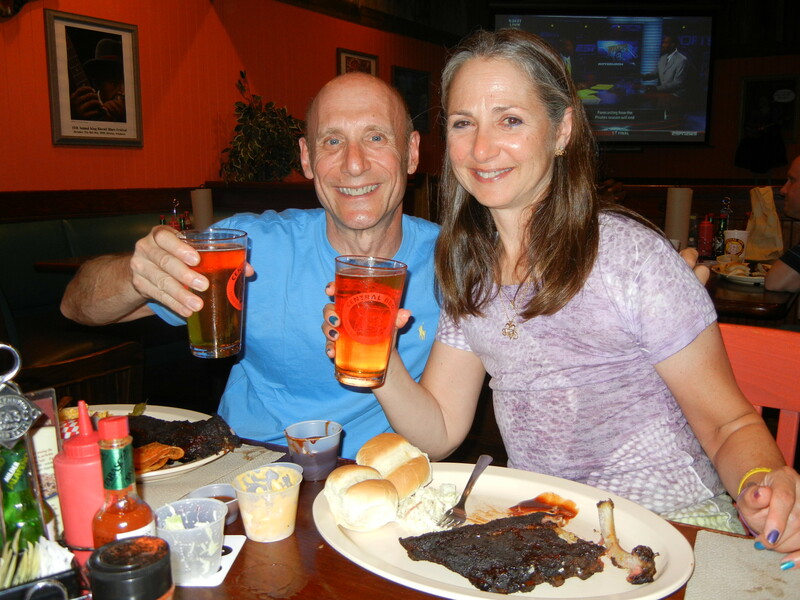 Drinking Ghost Rider Golden Ale and eating ribs. Life is good. Tomorrow: we ride in Arkansas of all places, and pay our respects to “The King”. Check back for details. Thank you, thank-you-very-much.